Prejudice and racism have been responsible for a great deal of suffering in the past. A mere walk down the memory lane unveils countless wars that were fought solely for the purpose of freedom from racial discrimination and several laws that were enforced to break stereotypes. Regardless of this, the society we live in today is not free of discrimination, and racism and prejudice continue to be destructive elements of one’s personality that are inculcated by the society itself. A clear distinction between the two terms is therefore absolutely essential. Even though the two words can be used interchangeably at times, they refer to concepts that are quite contrasting from one and other and must be understood in detail. The term “prejudice” refers to preconceived judgment of an individual or situation that is not based on reason. Such an irrational opinion may lead to hostility and discrimination against people simply because they belong to a particular religious, social or political group. “Racism” however is the belief that one race is superior to another and may be the cause of unfair treatment towards another race because of the sheer belief that inherent differences govern the acquisition of traits, skills and knowledge. Hence, racism could be defined as a form of prejudice that is directed against a specific ethnic group. One of the most important differences between the two is origin. 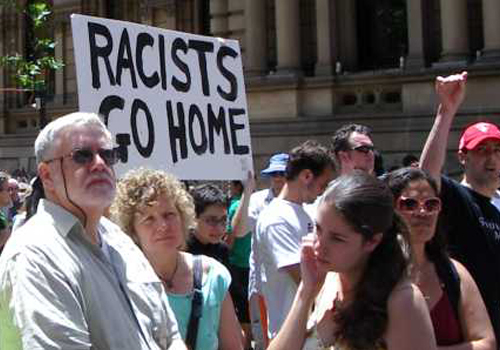 From the sociological viewpoint, racism stems from the socialization of an individual. It may be learnt from parents and relatives or the media. It may also originate from the need to achieve economic benefits. An example of this could be incorporating racial discrimination in a job set-up to reduce competition; an organization that does not hire blacks assuming that they are ‘dumb’ or ‘lazy’ – something that is not unheard of even today. Prejudice, on the contrary, is learnt from experience. A salesman may form an opinion about the social status of his customers based on their attire from his experience. This has little to do with their race. So in a nutshell, racism is usually taught or instilled in one’s mind by those belonging to the same race as him while prejudice is learnt from experience. This does not however mean that the two concepts cannot overlap. Another important difference is the impact that they may have on those who are targeted. Prejudice may not always be accompanied by discrimination. Some may also argue that in certain circumstances prejudice can be healthy and may sometimes be essential for one’s survival. For example, if you see a dog charging towards you, it is your inherent belief or prejudice that it will bite so your first reaction would be to run or call for help even if the dog does not do so. It is human nature to categorize things and prejudice is vital for this learning process. In addition to this, a prejudice, for instance calling someone a dumb blonde might result in frustration. It would not affect their job opportunities or their civil rights and freedom though. Racism, on the other hand is almost always destructive. It creates injustice and inequality. The racial discrimination against the African Americans in the US led to them being labeled as second class citizens who did not enjoy the same privileges as their fellow countrymen. They were ridiculed, looked down upon and enslaved, all of which affected their social and economic progress. Prejudice usually does not have such devastating effects. The solution to dealing with prejudice lies more on the individual than the national level. One must acknowledge the fact that all humans are created equal and must be treated as such. Contrary to this, racism can only be resolved by an approach that focuses on adopting a more pluralistic attitude on the individual level and making laws that enforce equal opportunities for all races in all sectors at the national level. allana. "Differences between Racism and Prejudice." DifferenceBetween.net. October 2, 2014 < http://www.differencebetween.net/miscellaneous/differences-between-racism-and-prejudice/ >.